I AM An Empowering Artist. I wrote to breathe at an early age; I took comfort in the beauty of writing. Words on paper were a means of transportation. I could be whomever and whatever I wanted to be, as I allowed my imagination to soar. In my youth, I was a quiet introvert with wisdom and insight. Not always understood, so I took comfort in writing down my feelings as well as my observations. Writing became my playground, battlefront and protective shield. Suffering losses at an early age further put me in a cocoon. Writing became my world and best friend. Now, in my adult life, with a career in Social Work/Psychology, writing remains my first love. It is not only my outlet, but it is my connection to reach others who may read my work and connect on a inspirational and deeper level. I am enraptured by words’ ability to heal. I see how words captivate children during story time. I see how words bring hope to women and men suffering to find out where their life went wrong. In addition seeing the positive, I also see how words can tear down if not used in a positive light. The power in words fascinates me and inspires my journey to grow stronger. 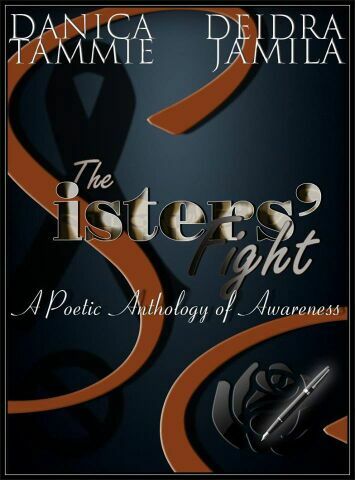 One of the reasons that I co-authored the book The Sisters’ Fight: A Poetic Anthology of Awareness was to shed light on the affects and effects of cancer and bullying. I wanted to contribute to something bigger than myself. We all have been affected by something, and this was my way of healing and confronting current issues. Being personally affected, I wanted to share my experiences with the battle and how we can learn to confront, combat, overcome and collectively fight against any obstacle. Contributing to my first book was a challenge because my journal entries were written only for me. When I started to share, I was fearful that it would not be well received. To my surprise, not only was my writing liked, but it uplifted. This is when I decided to let my voice be heard. I’m currently working on my second book titled Suffering in Silence. I want to continue my journey in self discovery and bring knowledge to the many issues one must face in order to truly be found. Do I still struggle with getting my words to flow? Yes, but I don’t let that stop me. The more I write, the easier it becomes. I’ve learned that writing is an art and I am in control of the story. I utilize many tools to bring life to my words. One tool that I love to use is vividness, the ability to convey a story through words that will present itself as a Netflix movie to the reader. As a writer and speaker, I now know that I have the ability to empower others to rise above the many stumbling blocks that life places in our way. We can use the positive and negative aspects in order to tap into our resiliency. I love to assist others in finding the light that resides within. It is rewarding, and brings me such joy. As an artist, we sometimes question our abilities as we create. One of the reasons is fear of stepping out on our own and wondering how we will be perceived. What I have learned is that we can be our hardest critic and allow self doubt to creep in. If we are giving from our authentic self, from the heart, what we have to offer will reach beyond any barrier. Being an artist is a gift. The ability to create from my imagination or my heartfelt truths is liberating. It allows me to stand on my personal platform, gleaming in the field of happiness and hopefulness. Despite our reasons for being creative gems, we all have a common goal and that is to express ourselves in our area of artistry. In this creative pool of genius, our greatest source of power is to support each other. To be clothed by edification, motivation and encouragement is pure empowerment. As you support your brothers and sisters of the craft, your light shines brighter. We become woven in a cloth of many different fibers, giving a voice to many who may not have ever been heard. We also empower the world by sharing our gifts. Think about the passion you have for what you do. Be in tune with what keeps you up at night and cultivate it. You never know how your influence can assist someone else on their artistic journey. If you are a new budding artist, do what you love for the fun and beauty of it. Be fearless, stay motivated, and devise a plan to achieve your goals. Keep track of your progress and acknowledge it. Connect with a community of support and research all that you can to further your efforts. Collect resources and people that you can call when you become stuck or reach an area where you have no knowledge. Thank you so much sis, I am humbled by your words, and support always. and goal-oriented. Keep up the great wor sis. P.S. Your middle name means people of victory. You have definitely displayed this. Wow:) Thank you so much sis Melica you inspire me, and I appreciate you for all that you do. I am so humbled right now, and believe the best is yet to come. Danica Let me say I am at a lost for words. The Inspiration that you bring is endless to me. The way you express your words are beautiful. Sometimes we must let go of our fears just so we can shine. I am very happy you allowed us into the heart of Danica. I can only imagine how many lives you will help and change for the best. Thank you for not only being a Inspiration in my life but a friend to my Ink of Poetry to my soul. Bless you! !